Patent-granted author Randall Dale Chipkar won multiple awards for The Motorcycle Cancer Book. Chipkar discovered a motorcycle-melatonin link generating worldwide attention for rider health safety. Motorcycle seat ELF EMF magnetic field radiation is flooding millions of motorcyclists. Concern includes prostate cancer, colon cancer, breast cancer, colitis, diabetes, pregnancy issues, etc. Motorcycle Cancer? won multiple book awards for Canadian author Randall Dale Chipkar. Chipkar discovered cancer-controversial ELF EMF magnetic field radiation invading millions of motorcyclists. Randall Dale Chipkar developed the Electromagnetic Pro-Ionization Principle to protect riders from ELF EMF radiation. Integrity must prevail over complacency and conventionalism. Canadian motorcyclist Randall Dale Chipkar won international awards for The Motorcycle Cancer Book. Chipkar discovered a motorcycle-melatonin link generating worldwide attention for rider health safety. Motorcycle seat ELF EMF magnetic field radiation is flooding millions of motorcyclists. Concern includes prostate cancer, colon cancer, breast cancer, colitis, diabetes, pregnancy issues, etc. Chipkar wrote Motorcycle Cancer?, also known as The Motorcycle Cancer Book, to expose the truth about extremely low frequency electromagnetic field (ELF EMF) radiation penetrating up through motorcycle seats. “No one, especially pregnant women and cancer survivors, wants cancer-controversial magnetic radiation flooding their entire body every time they ride,” says Chipkar. Motorcycle Cancer? won the 2011 eLit Health/Medical Bronze Award and Silver Medal for Randall Dale Chipkar, the Health eBook Award-2012 International Book Awards and the IBA Health: Men's Health Finalist Award. “I am grateful for the awards and international recognition. Consumer safety is priority,” says Chipkar. The USA, Canada and the UK have granted the RiderSaver trademark to Chipkar for ELF EMF magnetic field shielding motorcycle seats. “Motorcycle oscillating-current electrical systems can generate excessive ELF EMF radiation that penetrates through steel, lead, aluminum, tin, etc. The enveloping magnetic field radiation invades vital gastrointestinal and bone marrow melatonin, as well as the breast, heart, lungs, prostate, colon and neighboring organs,” Chipkar says. “Bone marrow melatonin controls oxidation and cytotoxicity for developing red blood cells, white blood cells, stem cells, dendritic cells, B-cells, T-cells, NK-cells, etc. which are crucial for immune system defense against pathogens, disease and cancer throughout the body,” adds Chipkar. “Non-ionizing, non-thermal ELF EMF magnetic fields are linked to adverse ion/electron bio-effects that include the disruption and suppression of melatonin - our body’s cancer-growth inhibiting hormone. It’s not just about cancers. Countless health conditions occur from melatonin compromise,” Chipkar says. “People have a right to physiological integrity without synthetic electromagnetic intervention. 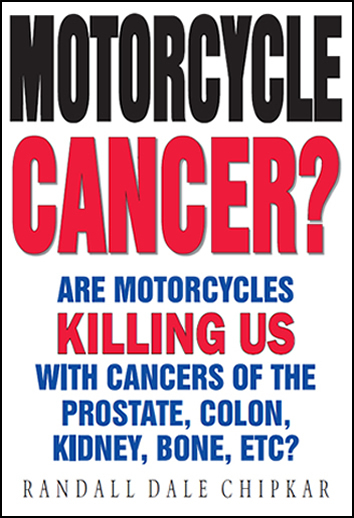 The facts in Motorcycle Cancer? cannot be ignored. The global motorcycle industry urgently requires ELF EMF emission control to reduce rider health risk and confirm consumer confidence,” says Chipkar. “Spinning steel-belted radial motorcycle tires can also generate ELF magnetic fields into the rider’s groin which is only inches away. Although the fields are not of electrical origin, exposure is relevant especially at highway speeds,” adds Chipkar. “Excessive ELF EMF exposure concern includes cancer medication compromise, breast cancer, prostate cancer, testicular cancer, bowel cancer, colorectal cancer, cervical cancer, uterine cancer, kidney cancer, stomach cancer, liver cancer, bone cancer, lymphoma, melanoma, leukemia, fibromyalgia, insomnia, Crohn’s, ulcers, enlarged prostate, impotence, candida, diabetes, heart disease, pregnancy issues, etc.,” Chipkar adds. “The Motorcycle Cancer Book, motorcycle cancer website and Motorcycle Cancer Risk YouTube videos prove ELF EMF radiation danger for motorcyclists. Together we can make a difference to keep riders safer,” says Chipkar. Randall Dale Chipkar developed the Electromagnetic Pro-Ionization Principle, Motorcycle Cancer Risk Worldwide Petition and International Motorcyclist Electromagnetic Safety Month Proclamation for governments to keep riders safer. Patent-granted Randall Dale Chipkar discovered a motorcycle-melatonin link requiring magnetic radiation emission control to reduce rider health risk.Chipkar developed The Motorcycle Cancer Risk Worldwide Petition for international governments to keep riders safer from ELF EMF radiation. Motorcycle Cancer? won the Health eBook Award-2012 International Book Awards and the IBA Health: Men's Health Finalist Award.The USA, Canada and the UK have granted the RiderSaver trademark to Randall Dale Chipkar for magnetic field shielding motorcycle seats. Randall Dale Chipkar published the Motorcycle Cancer website and Motorcycle Cancer Risk YouTube videos for rider health safety.Motorcycle excessive ELF EMF radiation invasion of gastrointestinal and bone marrow melatonin is unacceptable. Consumer safety is priority. Motorcycle Cancer? won the 2011 eLit Health / Medical Bronze Award and Silver Medal for Randall Dale Chipkar.The Electromagnetic Pro-Ionization Principle was developed by Randall Dale Chipkar to protect motorcyclists from ELF EMF magnetic field radiation emission. Motorcycle Cancer? exposes the truth about ELF EMF radiation penetrating up through motorcycle seats. Together we can make a difference to keep riders safer.Conquering cancer requires our utmost attention concerning any potential source of cancer causation, cancer-growth promotion or cancer medication disruption.